Die-hard Apple fanatics are not the only ones excited about the launch of iPad mini – physicians have been eager to get their hands on the new device because it easily fits inside a lab coat pocket. Who knew? According to a survey conducted by Epocrates, a leading developer of point of care medical applications, one in three physicians indicated that they’re planning to purchase an iPad mini because of it’s lab coat pocket-ability on the job. Some 90% of responding physicians cited the smaller size as the main motivator of interest — stating it would be easier to carry around with them on rounds. 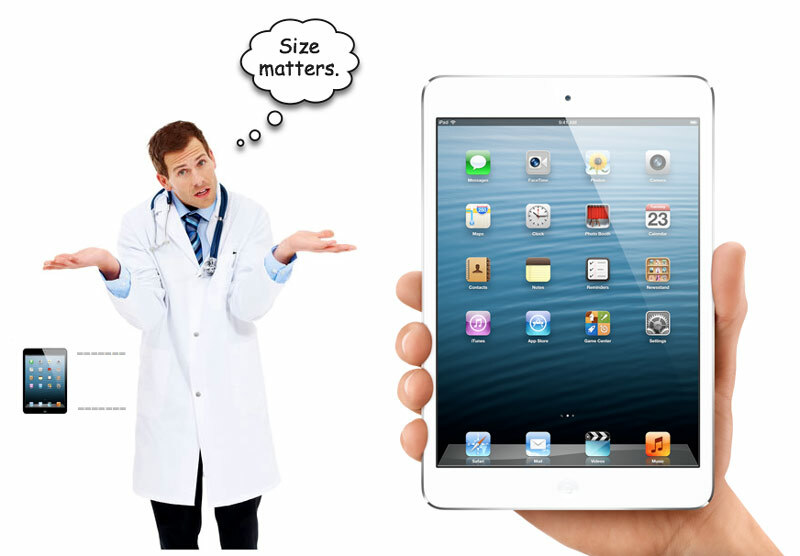 Coming in at a height of of 7.87 inches and a width of just 5.3 inches, iPad mini has passed the all important “lab coat test” — which makes it an ideal fit for doctors over the original iPad which does not fit easily inside a traditional lab coat. In a Washington Post interview, Forrester tech analyst Sarah Rotman Epps noted that the smaller and lighter iPad mini will prove popular for healthcare workers. Although Epocrates has been widely available for smartphone-toting doctors since 2011, the app will finally become available for iPad users in December. You can view the list of iOS friendly Epocrates mobile apps on their website. The iPad mini officially launched today in 34 countries and quickly sold out within two hours at Apple’s Fifth Avenue flagship store this morning. The 16GB version will cost you $329 in black or white models.